Welcome to the website of Otis Russian Blues. We are a breeder of pedigree russian blue kittens from a line of quality russian blues, located in Chesterfiled, Derbyshire. 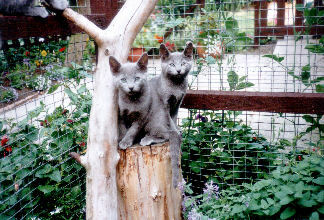 We are members of the RBBA (the Russian Blue Breeders Association) and our cats are GCCF registered. On our website you will find a wealth of information regarding russian blues with guidance on homing a pedigree russian blue kitten (or kittens!) and our procedures. We also have an online database where you can see pictures, pedigree, cat show information of your new pedigree russian blue kitten as it grows (see the database page for more information). We started breeding Russian Blues in 1993 with our 1st breeding blue queen Nastova Puschkinia (sister to the late Gr Pr Nastova Daboecia) and she went on to produce very beautiful russian blue kittens until she retired at the grand old age of 8!! We also had Karela who unfortunately has joined her brother in cat heaven end of 2006. We still have Ruski (one of Puschkin's offspring) who is as loveable as ever. Ruski (our little boy russian blue) has done really well on the show bench, achieving Premier status in May 2002. Our most recent addition to the family is new kit on the block - 'Pushka', our new breeding queen, who is one of Aleksei's kittens born April 2007, we hope she will produce some wonderful kittens in the future. I have written some articles for Cat World (see issues 202 and 219) about Kholmogory (Karela's brother) who had a nasty brush with death when he devoured a dried flower bouquet. It's a amazing that something so small can cause so much of a problem. Last but certainly not least is our current pedigree blue breeding queen, Aleksei, who has produced some wonderful blue kittens in her time and is a caring and gentle queen towards her little ones. 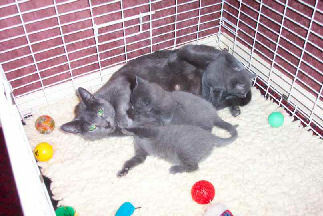 All of our pedigree russian blue kittens are kept in a caring home environment with the breeders family. One of our latest russian blue kittens, Otis Tsarevich Nijinsky has been entered into the database. By clicking on his name you can see the information we hold in the database. Anything in red (pictures,text etc) which changes in colour when you hold the mouse pointer over is a link - click on it to see what happens! Your browser must allow for pop up windows for this to happen.